Senate Bill 24 is Senator Leyva’s latest attempt at getting publicly funded abortions onto all of the UC and California State University campuses. 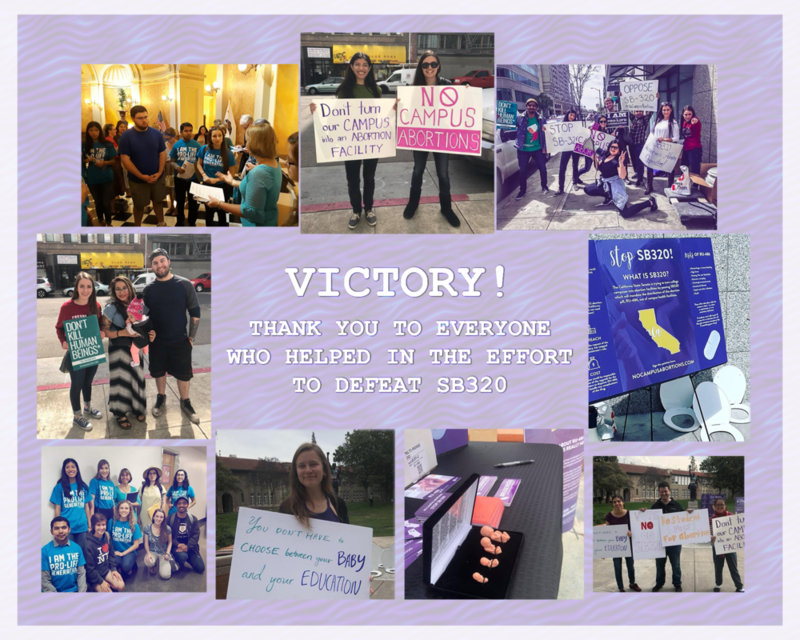 Her previous bill, SB320, was vetoed by Governor Jerry Brown back in September. Below the videos, you’ll find a link to the text of the new bill along with a formatted version that’s easier on the eyes. The first committee hearings will probably be in early Spring, 2019. Update: The first hearing is scheduled for April 3rd! State Senator Connie Leyva dismissing the idea of conscience protections for college health center employees who don't want to participate in an abortion. Preventing student fees and tax dollars from going toward the campus abortion program sounds like a good idea. Why did the author avoid writing such a prohibition? It's clear: they don't intend to rely solely on private funding and billing. What was she trying to say? That pregnant people need greater access to abortion so that they can roll over and comply with pregnancy discrimination? Students have Title IX rights & parenting students can succeed! An act to add Chapter 5.5 (commencing with Section 99250) to Part 65 of Division 14 of Title 3 of the Education Code, relating to public health, and making an appropriation therefor. SB 24, as introduced, Leyva. Public health: public university student health centers: abortion by medication techniques. Existing law establishes the University of California, under the administration of the Regents of the University of California, and the California State University, under the administration of the Trustees of the California State University, as 2 of the segments of public postsecondary education in this state. This bill would express findings and declarations of the Legislature relating to the availability of abortion by medication techniques at on-campus student health centers at public postsecondary educational institutions in the state. The bill would require, on and after January 1, 2023, each student health care services clinic on a California State University or University of California campus to offer abortion by medication techniques, as specified. The bill would require the Commission on the Status of Women and Girls to administer the College Student Health Center Sexual and Reproductive Health Preparation Fund, which the bill would establish. The bill would continuously appropriate the moneys in that fund to the commission for grants to these student health care clinics for specified activities in preparation for providing abortion by medication techniques, thereby making an appropriation. The bill would provide that its requirements would be implemented only if, and to the extent that, a total of at least $10,290,000 in private moneys is made available to the fund in a timely manner on or after January 1, 2020. The bill would require the commission to submit a report to the Legislature, on or before December 31, 2021, and on or before December 31 of every year thereafter, until December 31, 2026, that includes, but is not necessarily limited to, specified information relating to abortion by medication techniques at these student health clinics. (a) Abortion care is a constitutional right and an integral part of comprehensive sexual and reproductive health care. (b) More than 400,000 students classified as female are educated at California’s public university campuses, and it is central to the mission of California’s public university student health centers to minimize the negative impact of health concerns on students’ studies and to facilitate retention and graduation. (c) The state has an interest in ensuring that every pregnant person in California who wants to have an abortion can obtain access to that care as easily and as early in pregnancy as possible. When pregnant young people decide that abortion is the best option for them, having early, accessible care can help them stay on track to achieve their educational and other aspirational life plans. (d) All California public university campuses have on-campus student health centers, but none of these health centers currently provide abortion by medication techniques. Abortion by medication techniques is extremely safe, highly effective, and cost effective. Abortion by medication techniques is an essential part of comprehensive sexual and reproductive health care, and should be accessible at on-campus student health centers. (e) Staff at on-campus student health centers include health professionals who are licensed to provide abortion by medication techniques. Under current California law, all residency programs in obstetrics and gynecology include training in abortion. Physicians, nurse practitioners, physician assistants, and certified nurse-midwives are legally authorized to perform abortions by medication techniques. Any clinician legally authorized to provide abortion, but not currently trained to provide abortion by medication techniques, can be trained inexpensively to do so, and such training falls within the requirements of continuing education for medical providers. (f) The National Academies of Sciences, Engineering, and Medicine have found that prescribing abortion by medication techniques is no different from prescribing other medications, and have also found that the risks of providing abortion by medication techniques, including via telehealth, are low and similar to the risks of serious adverse effects of taking commonly used prescription and over-the-counter medications. (g) Students seeking early pregnancy termination, especially those enrolled at institutions outside of major urban centers, face prohibitively expensive travel, often without reliable means of transportation, to a clinic that may require hours of travel from their campus, out of their city, county, or even geographic region. These financial and time burdens negatively impact academic performance and mental health. (h) California law recognizes abortion as a basic health service that must be covered by Medi-Cal and by private, managed care insurance plans regulated by the state. (i) It is the intent of the Legislature that public university student health centers make abortion by medication techniques as accessible and cost-effective for students as possible, and thus public university student health centers should treat abortion by medication techniques as a basic health service. (a) “Commission” means the Commission on the Status of Women and Girls established by Section 8241 of the Government Code. (b) “Fund” means the College Student Health Center Sexual and Reproductive Health Preparation Fund established by Section 99251. (c) “Grantee” means any qualifying student health center at a public college or university. (d) “Medication abortion readiness” includes, but is not limited to, assessment of each individual clinic to determine facility and training needs before beginning to provide abortion by medication techniques, purchasing equipment, making facility improvements, establishing clinical protocols, creating patient educational materials, and training staff. “Medication abortion readiness” does not include the provision of abortion by medication techniques. (e) “Public university student health center” means a clinic providing primary health care services to students that is located on the campus of a university within the University of California or California State University systems. (a) On and after January 1, 2023, each public university student health center shall offer abortion by medication techniques onsite. This service may be performed by providers on staff at the student health center or by providers associated with a contracted external agency. (b)	(1) The commission shall administer the College Student Health Center Sexual and Reproductive Health Preparation Fund, which is established by this chapter for the purposes of providing private moneys in the form of grants to public university student health centers for medication abortion readiness. Notwithstanding any other law, the commission is authorized to receive moneys from nonstate entities, including, but not necessarily limited to, private sector entities and local and federal government agencies, and deposit these moneys in the fund. (2) Notwithstanding Section 13340 of the Government Code, the moneys in the fund are continuously appropriated to the commission for allocation for purposes of this subdivision. (i) Purchase of equipment used in the provision of abortion by medication techniques. (ii) Facility and security upgrades. (iii) Costs associated with enabling the campus health center to deliver telehealth services. (iv) Costs associated with training staff in the provision of abortion by medication techniques. (v) Staff cost reimbursement and clinical revenue offset while staff are in trainings. (i) Providing 24-hour, backup medical support by telephone to patients who have obtained abortion by medication techniques at a public university student health center. (ii) One-time fees associated with establishing a corporate account to provide telehealth services. (C) Paying itself for the costs, both direct and indirect, associated with administration of the fund, including the costs of hiring staff and the costs of reporting to the Legislature, not to exceed three million ninety thousand dollars ($3,090,000). (D) Maintaining a system of financial reporting on all aspects of the fund. (4) Each public university student health center grantee shall, as a condition of receiving a grant award from the fund, participate in an evaluation of its medication abortion readiness and its provision of abortion by medication techniques. (5) The requirements of this chapter shall be implemented only if, and to the extent that, a total of at least ten million two hundred ninety thousand dollars ($10,290,000) in private funds is made available to the fund in a timely manner on or after January 1, 2020. (6) Nothing in this chapter shall be interpreted as requiring a public university to utilize General Fund moneys or student fees for medication abortion readiness before January 1, 2023. (c) The commission, working with the public university student health centers, shall assist and advise on potential pathways for their student health centers to access public and private payers to provide funding for ongoing costs of providing abortion by medication techniques. (A) The number of student health centers that provide abortion by medication techniques. (B) The number of abortions by medication techniques performed at student health centers, disaggregated, to the extent possible, by student health center. (C) The total amount of funds granted by the commission to the university and the university’s student health centers that is expended on medication abortion readiness, and, separately, the total amount of any other funds expended on medication abortion readiness and the source of those funds, disaggregated by function and, to the extent possible, disaggregated by student health center. (D) The total amount of funds expended on the provision of abortion by medication techniques and the source of those funds, disaggregated by function and, to the extent possible, disaggregated by student health center. (2) The report required in paragraph (1), and any associated data collection, shall be conducted in accordance with state and federal privacy law, including, but not necessarily limited to, the state Confidentiality of Medical Information Act (Part 2.6 (commencing with Section 56) of Division 1 of the Civil Code), the federal Family Educational Rights and Privacy Act of 1974 (20 U.S.C. Sec. 1232g), and the federal Health Insurance Portability and Accountability Act of 1996 (Public Law 104-191). (3) The requirement for submitting reports under paragraph (1) shall become inoperative on January 1, 2027, pursuant to Section 10231.5 of the Government Code. People from across the state banding together in 2018. You can make a big impact from your home, in your districts, and in Sacramento next year. Join a group in the California coalition and have your voice heard.